With Cushing's, a lot of people have multiple surgeries. I have had 3 directly related to Cushing's, and may have to have more in the future. Of course, you know that there is a huge time commitment to having a chronic illness. Lab tests, imaging, appointments, days spent in bed. Also similar to cancer. I am currently taking a chemotherapy drug for Lupus. I may need radiation in the future for my pituitary tumor if it grows back. 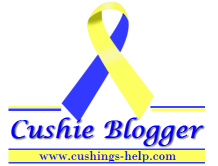 I have known more than one person who has died as a result of Cushing's. Not so different now, right?